Soap molecules have an outer shell that attracts water (hydrophilic) and an inner core that attracts oil (lipophilic). This allows the oils, grease and dirt in water to be absorbed and washed away. These soap molecules, along with glycerin, are created by combining tryglycerides (oils and fats) with a strong alkali solution (sodium hydroxide and water = lye). The chemistry involves exacting proportions of every ingredient to ensure a safe, effective, luxurient bar of soap! Each oil, fat, butter, botanical, and fragrance ingredient brings its own qualities to the finished soap. A remarkable bar of handmade soap will have excellent properties of hardness, cleansing, conditioning, moisturizing, bubbly and creamy lather. Pretty to look at, with a great fragrance! Clayburn Comforts' remarkable soaps are lovingly handmade using the cold process method, with all plant-based certified organic oils and butters, and fragranced with pure therapeutic grade essential oils. Natural botanicals are used for colour and texture. Each bar produces copious lather and bubbles and is safe, luxurious and unique. Glycerin is a natural by-product of the soapmaking process and is a "humectant", which means that it attracts and retains moisture on your skin. It's like having a skin lotion right in the soap! 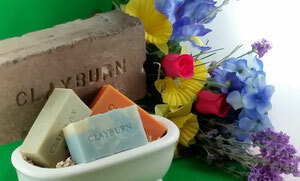 Our soaps retain all their natural glycerin so your skin feels clean and healthy, never dry or irritated. There is no comparison to a high quality, handmade soap! Our unique soaps are hand poured into soap molds and allowed to set and saponify for 2 days, after which time they are removed from the molds and placed on drying racks to finish the curing process. From start to finish it takes a minimum of 3 weeks before they are ready to use. To help minimize our carbon footprint, we use Biolefin, a biodegradable film to shrinkwrap our soaps, so we can feel good about letting their beauty show.